Here we have a new teaser and character posters for the OCN drama Black, which gives us a little more detail about the relationship between the main characters. In the drama, Go Ara (Hwarang) plays human clairvoyant Ha-ram, while Song Seung-heon (Saimdang, Light’s Diary) plays grim reaper Black, who inhabits the body of a cop on earth. She can see death before it happens, and he protects death, but somehow they end up forming an unlikely alliance to defy the laws of heaven to save lives. The teaser starts off with Song Seung-heon being reprimanded by his police investigator superiors at the scene of a crime. After a long day of work, the cops join for dinner, and they mutter under their breaths about Song Seung-heon’s incompetence, while he apologizes and drinks. At the scene of an attempted suicide, Song Seung-heon finally meets Go Ara, “The Woman Who Predicts Death,” and she tells him that the man is going to die. He slurs to her, “Seeing death is not a curse, it’s a gift.” Her next premonition is about him, and she tells him that she saw someone holding a gun. True enough, Song Seung-heon gets held at gunpoint. The next thing we know, he’s choking her in a hospital bed, eyes wild with suspicion and demanding to know what she is. 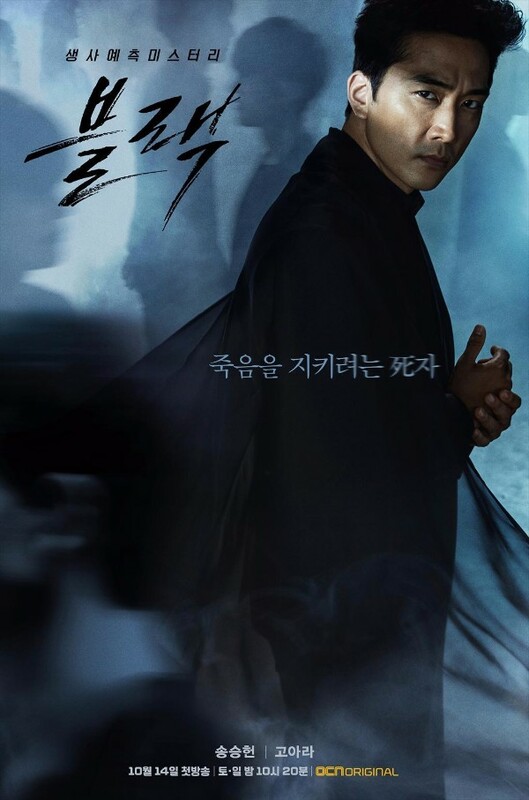 The teaser ends with Black walking through rolling fog, similar in tone to his character poster. Speaking of which, Song Seung-heon looks great in his poster, but then again, he looks good wherever you place him. His poster reads “Grim Reaper who protects death” and Go Ara’s poster reads “Woman who predicts death.” It’s too bad those aren’t more dynamic, like Lee El’s (The Lonely Shining Goblin) below, which shows her entire body animated with tension, from her tear-filled eyes to her locked hands performing CPR. She’s a confident and skilled physician, as well as a mysterious third party in the partnership between Black and Ha-ram, and her poster reads: “The beautiful emergency doctor, hidden underneath the veil.” While she’s an enigma to her colleagues at work, her character actually has a blindly loyal and innocent heart. To be honest, I’m most anticipating Lee El’s drama comeback, because the gal knows how to electrify the screen. OCN’s upcoming life-or-death supernatural mystery drama Black will begin on October 14.